I'm too tired to tell you much. Didn't sleep last night, woke up with a headache and queasy stomach. Around 11 am I felt a little better, and went out to join the trail work day in Sterling Marsh. 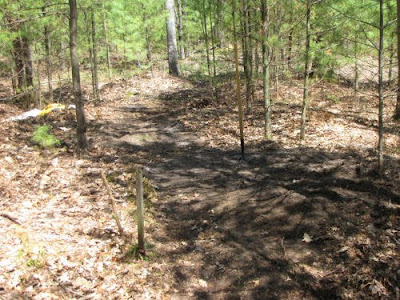 The Spirit of the Woods Chapter of the NCTA (trail cub) has been building boardwalk through there for two years. We have lots of plans for more this summer. I tried to get a picture that showed the water, but somehow, none of them really show how wet it is. 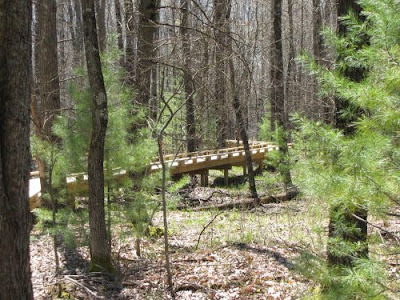 But this is the time of year that hikers will most appreciate the boardwalk. Today we weren't building though. We were doing what's called "benching" It means to cut trail into a slope so that it's smooth and just barely off-level (so that water runs to the low side). We have to widen the sections that won't be replaced by boardwalk so that we can bring in materials later in the year with a power wagon. Here's the section that I did today. Here are three of the guys hard at work. Well, everyone needs a rest from time to time! I'm on my way to bed. I can't even think straight. I'm behind on reading your blogs, and doing a lot of other things. Will try to catch up soon. It does look like a lot of work, but I know it must be greatly rewarding. The boardwalk looks good. I love boardwalks. And I can imagine how wet it really is out there. Even usually dry creek beds are soaked this time of year. Have a good rest, it is for the long journey ahead. 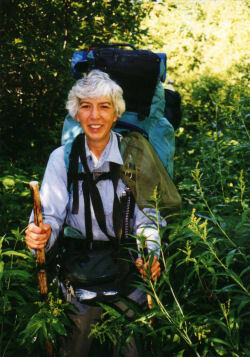 Where is the Sterling Marsh Trail? That boardwalk looks great! i also plan to someday follow your path and volunteer in the trails, hardwork, but i see those faces, and I know though tired but they are strengthened by the fruits of their labor. oh forgot to add, Happy Mother's Day, Sharkbytes. Ann- thanks! I am fine today... I just couldn't get to sleep until 5 am the other night. Ratty- you would love it. Lots of birds and frogs, and now with the boardwalk it's pleasant to walk there. rainfield- thank you, sleep fixes everything. John- it's part of the North Country Trail in southern Lake County, between the 76th St Trailhead and 96th St. Let me know when and I'll walk it with you! betchai- thank you so much! We get a lot of satisfaction from seeing improved trail. Good trail doesn't just happen! You work so hard, Joan, you definitely deserve a good night's sleep! 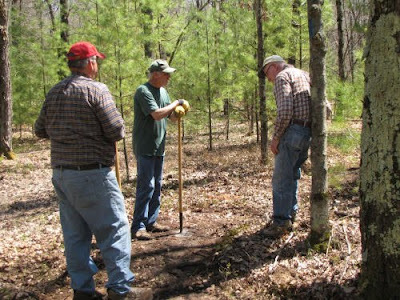 Getting out there in the woods and doing hard labor isn't my idea of fun..but it sounds like a veryw worthwhile project! Carmen- We didn't really work very hard. We did it all very slowly. And I think it's fun!